The city of Houston recently went through terrible flooding due to Hurricane Harvey but came out #HoustonStrong. Despite Harvey and the crushing news of the Supreme Court allowing Trump to keep blocking refugee resettlement, here is a uplifting story from the city with the largest population of resettled refugees, highlighting the need for us to keep fighting for them. Outside Minute Maid Park, the Houston Astros stadium, milling amongst the blue and orange fans, Ghulam Kehar waits for Dayana Halawo and her family with tickets and a T-shirt to wear as she throws the ceremonial first pitch. He is the CEO and co-founder of Amaanah Refugee Services, which works with resettled refugees in Texas – the top state in the nation to host resettled refugees. 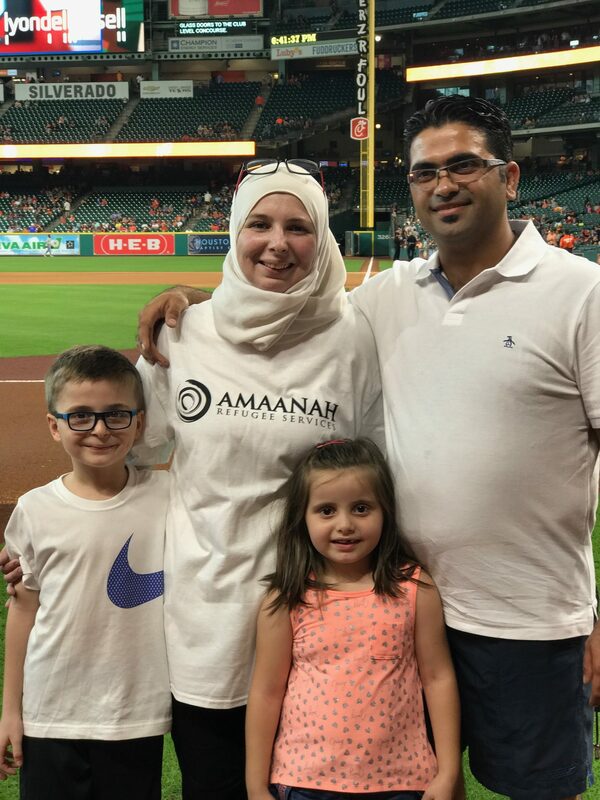 On July 31, 2017, Dayana, a Muslim resettled refugee who arrived in Houston from Syria last August, was invited by Amaanah to throw the opening pitch to open the game. This is a distinct American tradition, where a guest of honor throws a baseball to mark the end of pregame festivities and the start of the game. Amaanah chose Dayana for her resilience and spirit of giving back. Amaanah works with former refugees months after governmental resettlement assistance ends. Since 2008, Amaanah has touched the lives of over 10,000 refugees. 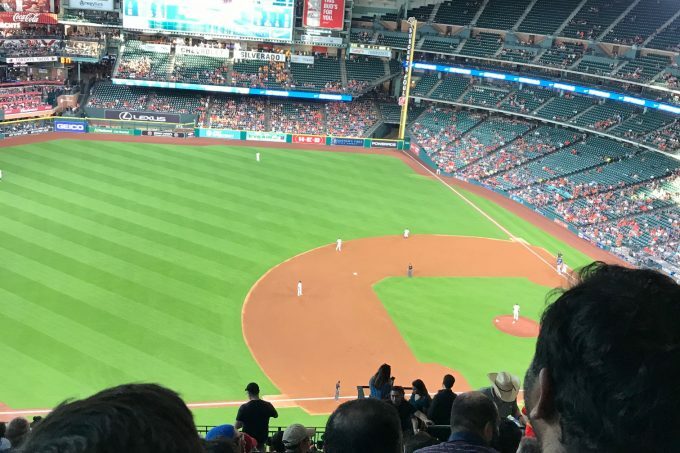 This is the second year the Astros — the leading team in the American League West— have worked with Amaanah to give refugees a “truly American” experience and a special honor. In 2005, Dayana met Mohamed Bilal. He owned the beauty store located in front of her house. Ethnic differences divided the families over the marriage, but the two were determined to become husband and wife. ”I left everything for Mohamed Bilal,” Dayana shares her love story. Her –happy– home became a warzone again in 2011. All supply routes to their city were blocked and aerial shelling and bombing filled their days and nights. When Assad’s forces bombed her neighborhood, Mohamed Bilal and Dayana barely escaped, clutching their 1-year-old son they ran out of her building. Nine months pregnant, Dayana was about to give birth to her daughter and understands how her mother felt leaving her life behind. Today, Bilal and Dayana have settled into a bustling life in cosmopolitan Houston, befriending people of all colors and paths in life. 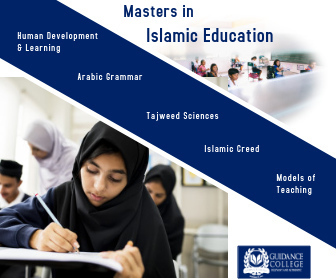 In Homs, she attended the Al-Salam school and became an English teacher at her alma mater. Now, the former refugee from Syria is giving back as an instructor at Amaanah’s Awesome Academy. Amaanah identifies resettled refugee populations in the school district, says Ghulam, and sends bilingual instructors [to] help the public school teachers during and after school hours. “We have become an additional support system for [former refugee] kids in the system,” he shares humbly. “Dayana is a teacher there – which is pretty cool,” he adds. Dayana arrives at Minute Maid Park, a baseball glove in hand and prayers on her lips. Her entourage is escorted to the VIP section of the stadium. “I am so nervous,” she says. “We play football in Syria,” she adds with a giggle. She has been practicing pitching for a few weeks but her face on the giant screen of the Jumbotron is setting off new waves of jitters. A buzz of reporters interviews her while her children look from behind the netting, seated in the dugout. Mohamed Bilal comes out with an Astros hat and a hug. The air is electric. “Go, girl, go!” yells a security guard. Her children, Laith and Joudi, wave from their seats. After a set of last minute instructions, the 5 foot 2 inch Dayana walks up to the mound on the perfectly manicured field. The crowd bursts into applause. In the upper deck 300 supporters were waiting for Dayana. “Wallah, you did well,” says her ‘coach’, a family friend, Yehia Omar, who showed her how to throw the ball. 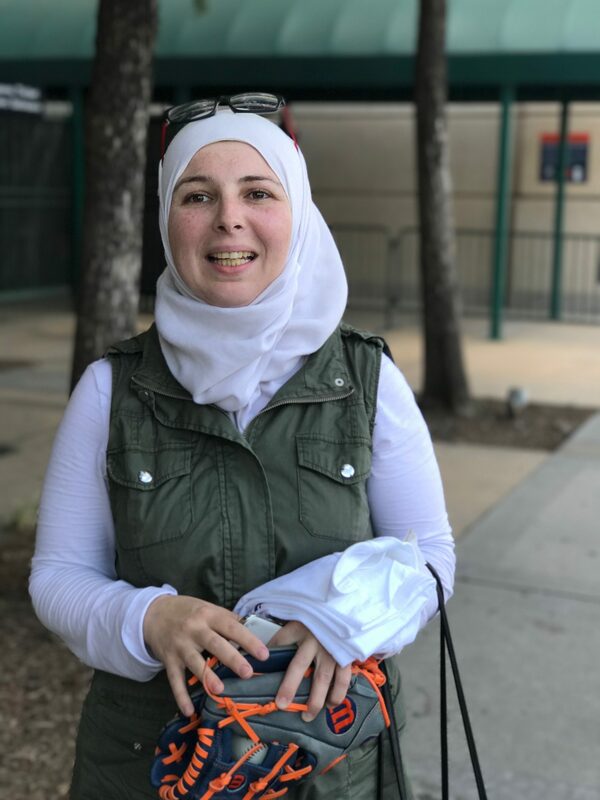 “She is amazing!” says single mom Ghadah Bayati, a former refugee from Iraq and Amaanah’s Transformed Program specialist, who is also in the stands celebrating Dayana. “We coach resettled single-mothers on financial management, employment, language, transportation and housing,” rattles off the former program participant. Refugees are admitted to the United States for humanitarian reasons but they also contribute to the American economy. An internal study done by the Departmant of Health and Human Services, which was completed in late July (around the time Dayana was invited to pitch the ball) but never publicly released, found that refugees “contributed an estimated $269.1 billion in revenues to all levels of government” between 2005 and 2014 through the payment of federal, state and local taxes. “Overall, this report estimated that the net fiscal impact of refugees was positive over the 10-year period, at $63 billion.” The New York Times reports that “the draft report, which was obtained by The New York Times, contradicts a central argument made by advocates of deep cuts in refugee totals,” including Stephen Miller, Trump’s chief policy officer. The Trump administratio, rejecting this study, has set a limit of 45,000 for refugees allowed to resettle in the United States. Last Februaury, 80 business leaders including CEOs urged the president to consider the serious harm to U.S. economic interests — including potentially billions of dollars in economic loss — that could result from overly-restrictive immigration policies based on unfounded security concerns. As business leaders, we have seen first-hand the positive economic benefits of immigrants and refugees in our communities and firms. Many of us have such heritage ourselves; indeed, 40 percent of all Fortune 500 companies were founded by refugees, immigrants, or their children. Immigrants and refugees revitalize shrinking cities and workforces, and create new business and American jobs. With their energy and vision, Mohammad Bilal and Dayana could easily be one of them. They have not let any of the hardships they have faced deter them from building and giving back to their new home. 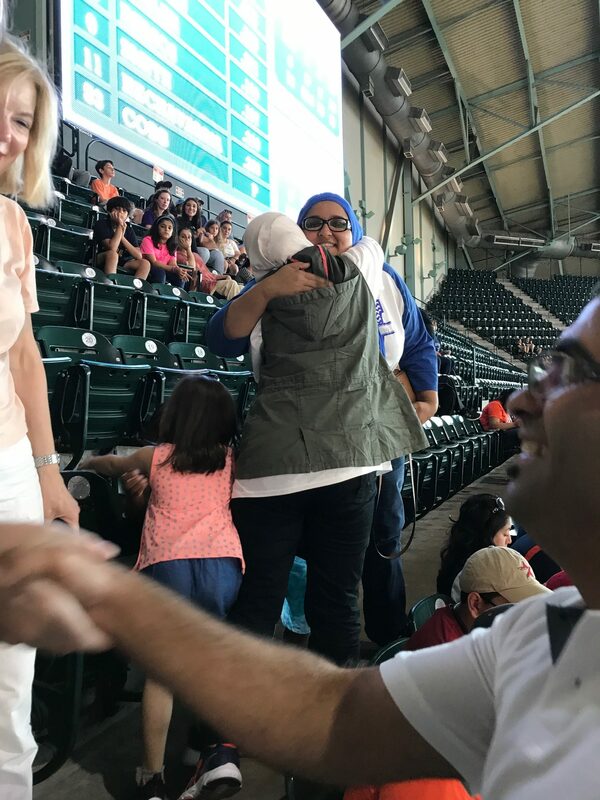 Up in the stands, Dayana’s friend Aminah Ishaq, an avid Astros fan, hugs her and cheers the homerun against Tampa Bay. They met when Aminah helped Mohamed Bilal find work as a handy man to add to his income from his job at a restaurant. “They refuse handouts,” shares Aminah. Now, Dayana teaches Aminah’s daughter the Quran. “She is such a generous soul,” confides Aminah, who was invited to a ‘huge feast’ at Dayana’s apartment during Ramadan. “She treats me like a sister,” says Aminah. I witness some of that hospitality as she invites me to her home. 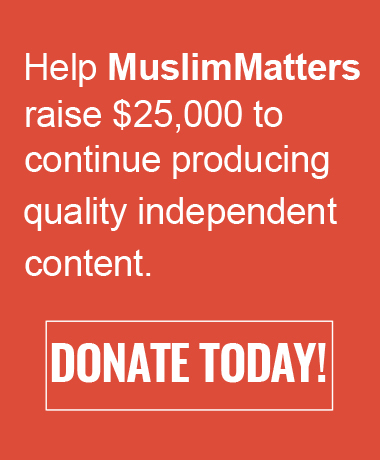 “Come and stay with me,” squeals Dayana, with a warm smile and an offer wrapped in traditional Muslim values. I will cook Syrian food for you,” she says to me, touched that I had flown from Washington D.C. to cover her story. I promise to meet up with her next time I am in her city. “I am so proud of you, Mama. You went out there and did that in hijab,” chirps Laith, his eyes brimming with pride for his brave mother who is reaching for the stars in their new home. SubhanAllah, amazing ppl out there! jazakhAllah khayr for covering this ukhti, been ages I read something positive.